The fruits and false leaves of Ruscus aculeatus, or butcher's broom. Butcher’s broom, whose stems were once supposedly bundled together by butchers in Europe to sweep the gunk off their cutting boards, is today widely peddled as a treatment for a variety of venous problems such as hemorrhoids and varicose veins. Its medicinal properties have apparently been recognized for more than 2000 years, and its long European history has given it a variety of names; it is also known as box holly, kneeholy, knee holly, kneeholm, pettigree, sweet broom, and Jew’s myrtle. It also occasionally goes by its scientific name, Ruscus aculeatus. Vein-healing properties and a tonf of names, however, are not the coolest things about this plant (at least to me). Butcher’s broom’s most evolutionarily odd feature is its complete lack of leaves. Yeah, those “leaves” in the picture above are not leaves at all but are rather “cladophylls,” or highly modified stems that have been flattened to essentially serve the purpose of a leaf. Flowers and fruits therefore grow on the cladophylls themselves, making for a very odd looking plant! The flowers of butcher's broom grow in the center of the cladophylls. Large fruit also grow from the centers of the cladophylls. Butcher’s Broom [Drugs.com] – This page has a lot of useful information about Butcher’s broom, particularly for those of you interested in its medicinal properties. 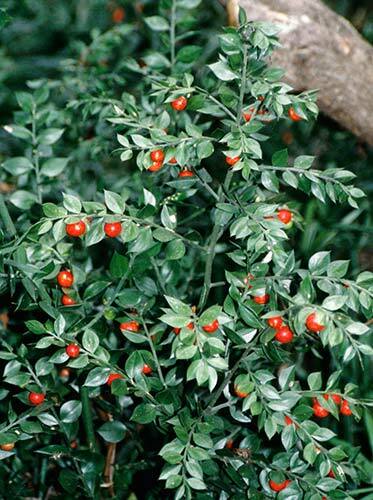 Ruscus aculeatus [Wikipedia] – Not much info here, but a good list of “synonyms” for butcher’s broom.